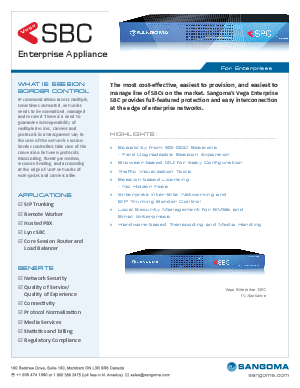 The most cost effective, easiest to provision, and easiest to manage line of SBCs on the market. Sangoma's Vega Enterprise SBC provides full-featured protection and easy interconnection at the edge of enterprise networks. In this data sheet, learn how the Vega Enterprise SBC Appliance can help your enterprise manage these growing and important concerns.